At 6:30 am Sunday June 8, I got out of bed and looked out through the rain to see standing water in the field across from our house and a large puddle of rain in our yard. I went downstairs and commenced my usual Sunday routine of coffee, NPR, and internet. When C came downstairs at 9:30 he had a worried look on his face. “Have you looked outside?” he asked. Confused, I got up and looked out the kitchen window and then upstairs to the bedroom window. In the 3 hours since I had looked out the window the river had overflown its bank and the field between the dike and river had flooded. The road into town was underwater. We moved books and small furniture from the living room to the upstairs and as the water continued to rise we began to pack toiletries, a change of clothes and bedding. The basement was rapidly filling with water, over four feet the last time we checked and when something electrical shorted and smoke tinted the air in the kitchen we decided it was time to leave. 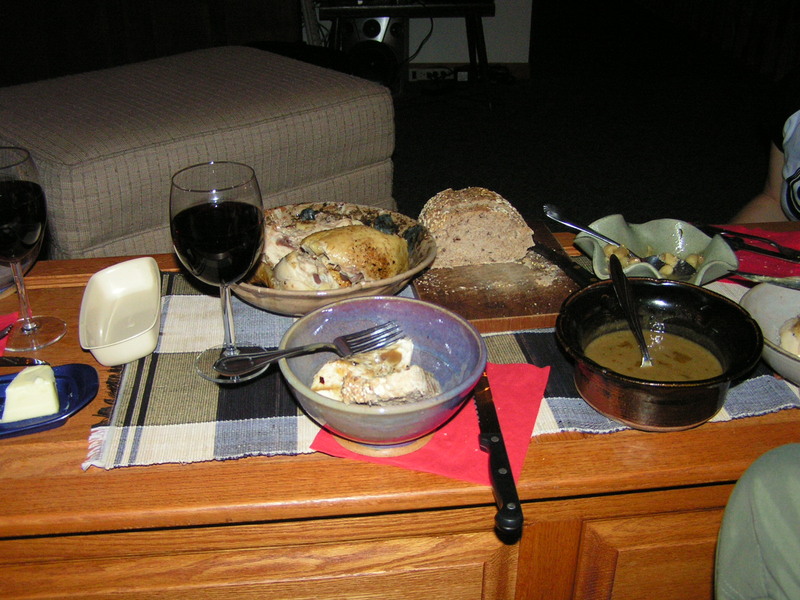 C grabbed photos and my wedding dress, I grabbed the chicken thawing in the fridge, several heads of garlic, wine and a recipe for Chicken with 40 Cloves of Garlic out of an issue of Fine Cooking. We had decided to evacuate to the safety of our friends 2nd story apartment and the least I could do was bring dinner. To good friends in high places.